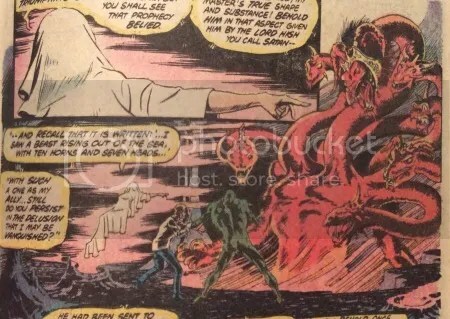 Lucky issue 13, The long awaited conclusion with Karen/Casey and the beast is finally here. The resolution seems rushed and a bit rough. The issue involves a few flashbacks/recaps and the twist at the end comes across more as a deus ex machina than a surprise. 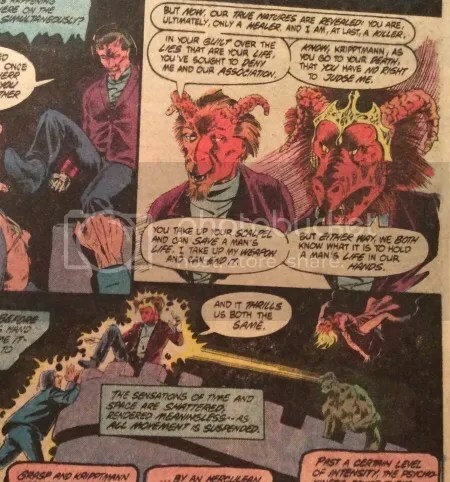 since issue 12, the cast of characters are beamed to the beast’s castle. 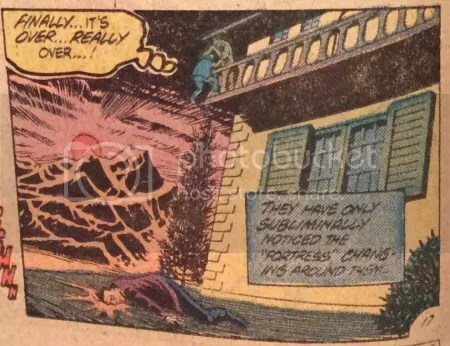 Liz is floating in the air, possessed, while Kay, Barclay, Grasp and Swampy figure out the situation they’ve fallen into. 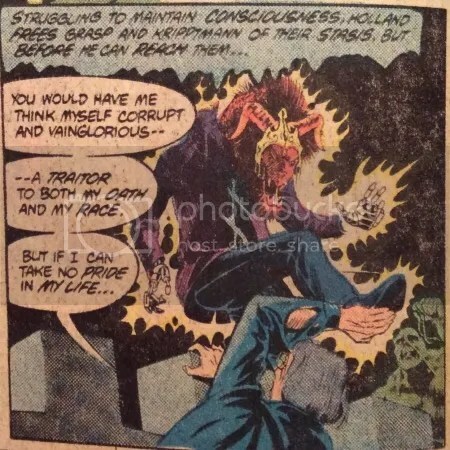 Our heroes are put into hallucination-like states with the hopes of leading them to their demise. 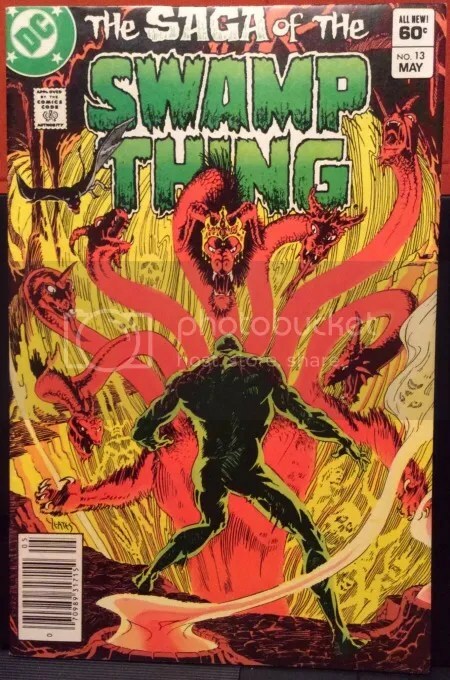 Swamp Thing narrowly escapes a spike pit while Barclay avoids a slow death involving quicksand. 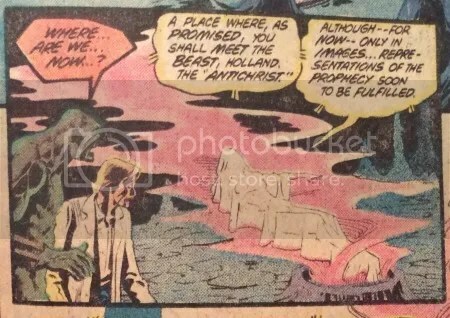 Without much explanation, Barclay and Swamp Thing find themselves in the bowels of the beast’s castle. 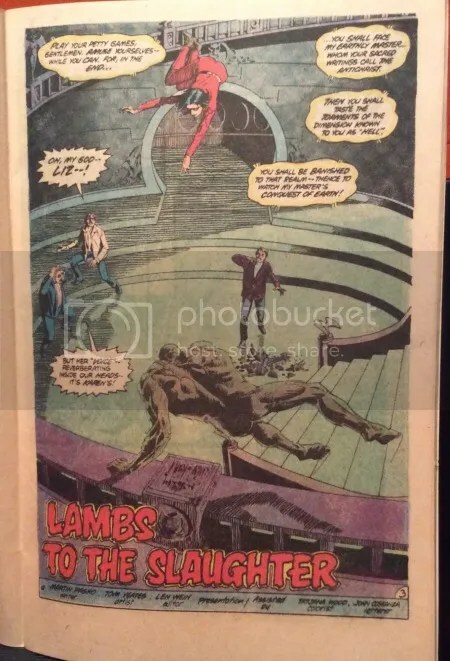 They are confronted by a floating, cloaked Karen and the beast. I’m not sure how her body made its way back to the castle since she had been killed and the evil spirit exited her body. 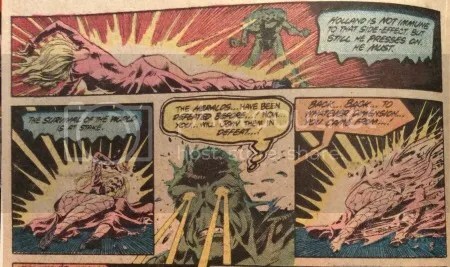 The beast reveals itself to Barclay and Swamp Thing yet they are focused on saving Liz from being destroyed by the Golem. 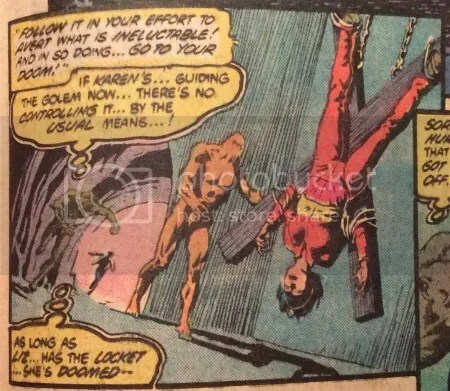 Close by, the Golem approaches Liz who is chained to a cross much like the one we’ve seen in Swamp Thing 2 (series 1). 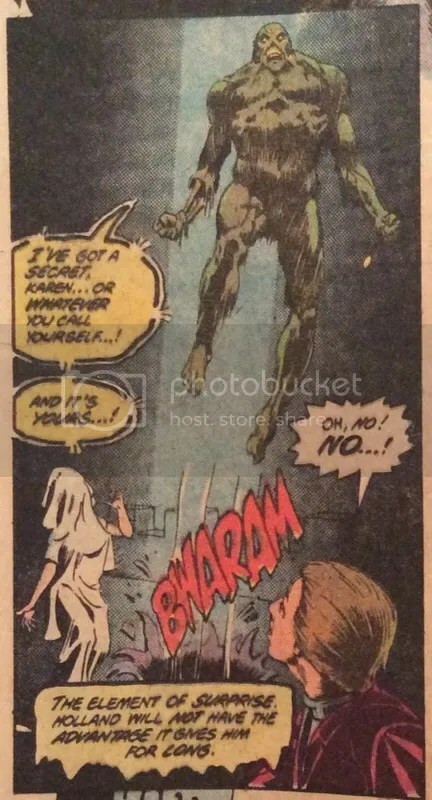 Swamp Thing realizes that he has absorbed some of Karen’s powers and now has the power to control and expel psionic energy. He blasts the Golem to smithereens. He then figures out that he can fly. 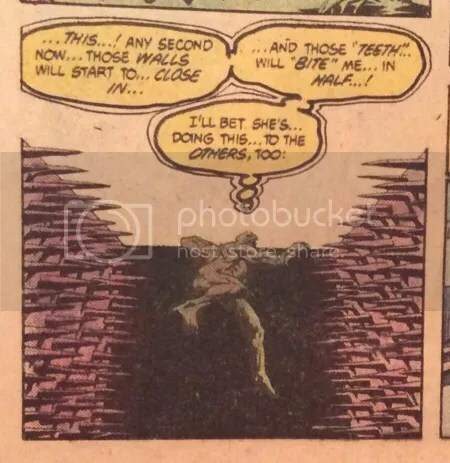 Swamp Thing breaks through the cave ceiling to the balcony where Kay just happens to be holding on for dear life. Somehow, the beast and cloaked Karen are already there trying to kill Kay. “Karen” is now some sort of demonic insect and Grasp reveals his true identity. 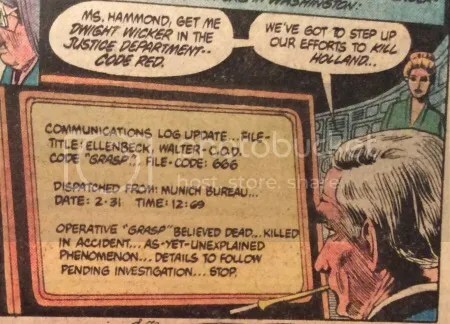 Grasp AKA Walter Ellenbeck is the beast. 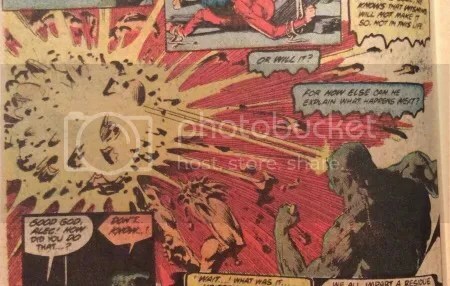 Swamp Thing destroys Karen again and then focuses his powers on the beast. Kay grabs the beast/Grasp’s foot and pulls him from the parapet. easy as it may be, that’s how you kill pure evil/the beast. After the beast falls to its death the castle returns to its true form, a large house. 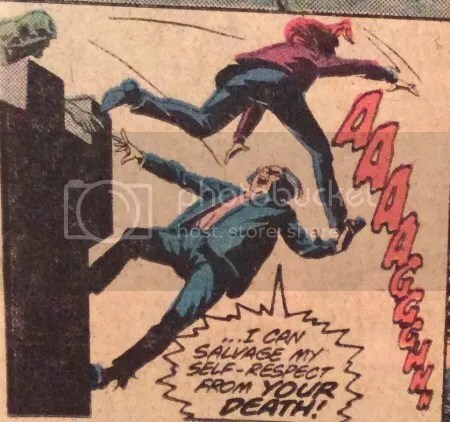 Based on Karen’s powers and previous battles/encounters, I’m assuming the beast left Grasp’s body before falling to its death but it isn’t explained. The fall doesn’t look too great. the proportion of the window in comparison to the balcony is off a bit. The odd details toward the end of this book help in making this story arc feel unresolved and rushed. 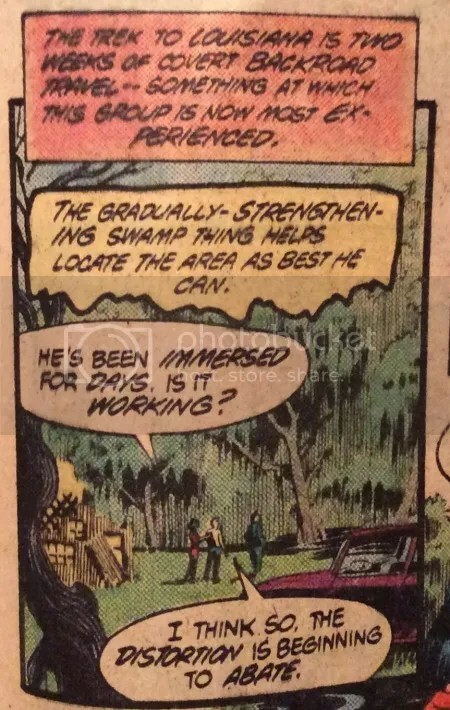 Barclay immediately announces that helping Swamp Thing is his number one priority. 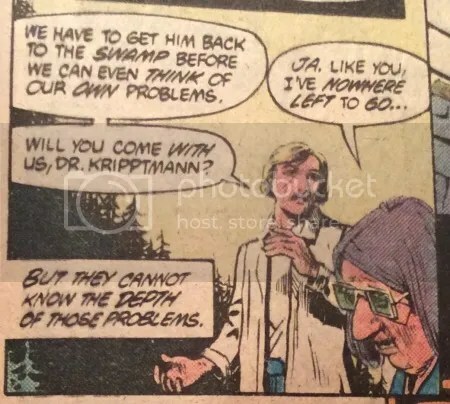 He finally has the opportunity to assist Swampy with his deterioration ailment. 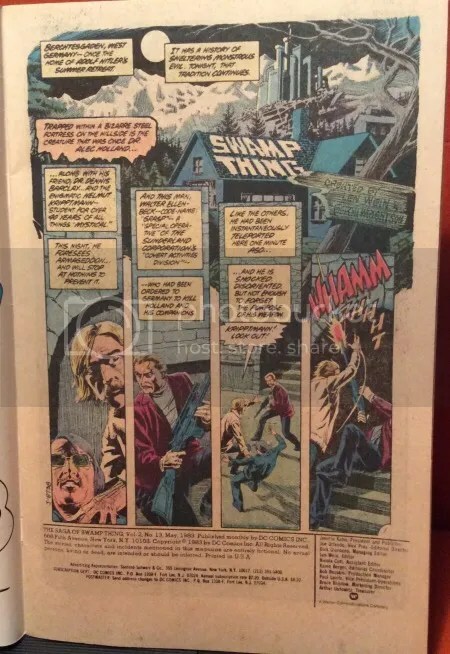 Barclay, Liz and Kay get Swamp Thing back to the Louisiana Swamp to recover. Sunderland and the Conclave receive the low-down on Ellenbeck’s fate and make plans to step up their efforts to kill Swamp Thing.